The only thing stopping West Iron County from an appearance in the state championship is a Friday night semifinal showdown. It’ll be perhaps the Wykons biggest challenge of the season in facing Saginaw Nouvel (12-0), who features a more passing-heavy spread offense. Kickoff is 6 p.m. CST on Friday at the Superior Dome on the campus of Northern Michigan University in Marquette. The game will be broadcast on the Prep Zone page on the Fox Sports Detroit website. It’s the only football game scheduled to take place in the state of any level including high school, college or professional. Nouvel’s spread offense features up to five receivers. The Wykons (11-1) dispatched Frankfort in last week’s regional title game 35-20. It was West Iron’s first regional championship since 1977. In that same year, the Wykons also beat a team called SS. 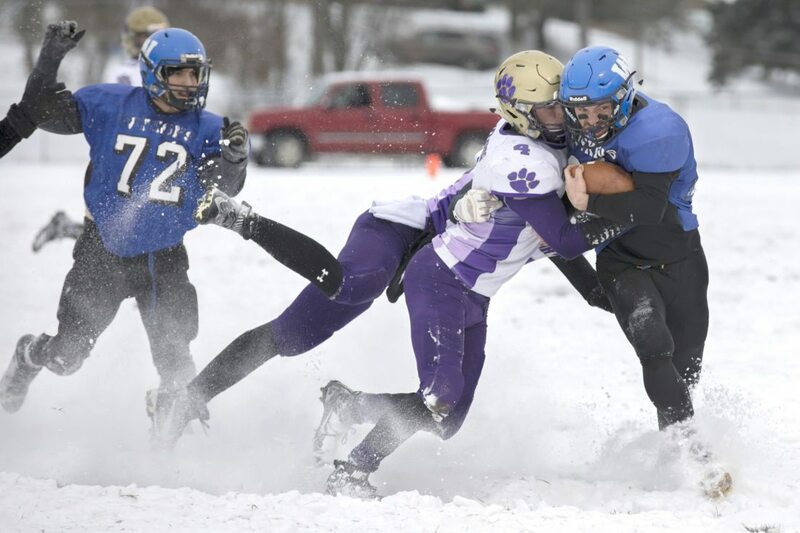 Peter & Paul 38-14 in a Class C semifinal in Mount Pleasant. In 1984, SS. Peter & Paul, Saginaw St. Mary and Saginaw St. Stephen merged into Saginaw Nouvel Catholic. The quarterback of the ’77 team for SS. Peter & Paul was Michael Boyd — the current Nouvel coach. Berutti said the identity of the Wykons won’t be changed to tackle the challenges Nouvel brings with its spread offense, run by dual-threat quarterback Tate Hausbeck. Last week, Hausbeck was 13 of 20 for 233 yards and three touchdown passes. He also ran seven times for 82 yards and two TDs. Hausbeck has completed 145 of 244 for 2,377 yards and 25 touchdowns with two interceptions this season. He has also run for about 650 yards. Nouvel’s leading rusher is Josh Kuligowski with 700 yards, including 146 last week. Peter Snyder and Kenny Kujawa each have more than 750 receiving yards. The Wykons have firepower of their own, starting with senior running back Jayce Brockhagen. This season, he’s ran for 1,348 yards on 187 carries (7.2 yards per carry) for 19 touchdowns. Quarterback Neil Tomasoski has ran for 400 yards on 82 carries (4.9 yards per carry) with eight touchdowns. Tomasoski has completed 42 of 74 passes for 702 yards and eight touchdowns with three interceptions. Caden Pellizzer has 15 catches for 256 yards and four touchdowns. Zach Quintero has eight catches for 177 yards and a TD. The defense will key West Iron’s chances on Friday as it has so far in the playoffs. The Wykons forced key turnovers and stops against Frankfort last week that kept the Panthers from establishing rhythm — all from a 3-4 formation the Wykons never ran before this season. Last week, Iron River-area businesses bought nearly $800 worth of tickets, allowing about 150 students to attend the regional title game for free. This week, the Wykons Booster Club bought tickets and arranged for two student buses and a parents bus to Friday’s game. Berutti said he hasn’t been around the school as much this week as the team practiced at Sherman Field, Michigan Tech’s home field in Houghton on Tuesday. On Wednesday, the Wykons practiced at the Superior Dome. — Follow sports editor Adam Niemi on Twitter @AdamNiemi for live updates during the game.